Not if, but when and how. I have been thinking about talking to Jake about being autistic. I have been thinking about it a lot. There is no doubt in my mind that we will tell him. It’s not an if. He has grown up so much this year. He lost two of his baby teeth this week. It was so not an issue, his dad was more freaked out than Jake was. He listens to us talk, he thinks about what we say. He’s not perfect, but I can see that he is becoming a compassionate, thoughtful, and responsible kid. I am incredibly proud of him. 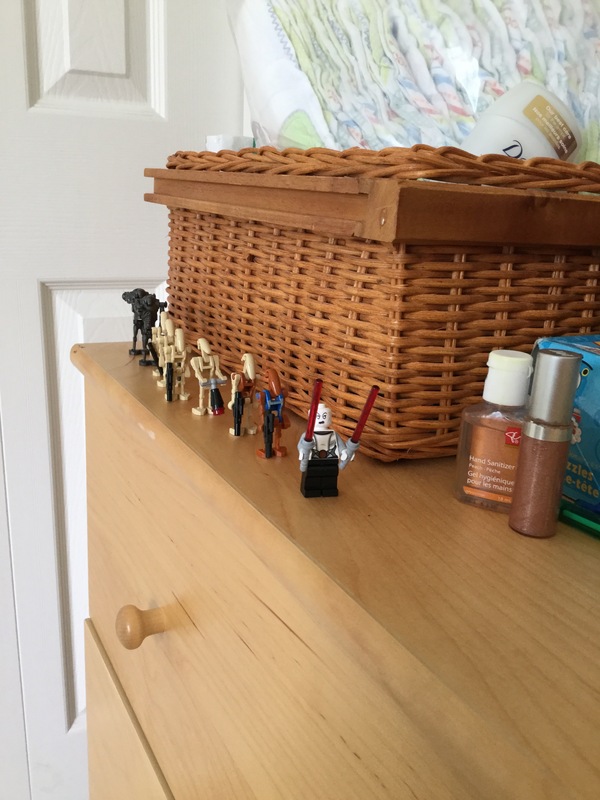 Asajj Ventress leading a battalion of battle droids to cause mayhem on my dresser. I know he needs to know. They already know that they’re different. You can’t keep them from knowing they’re different by not telling them. They deserve to know. They are entitled to accurate information about themselves. Yes, labels can carry stigma. But it’s the stigma that’s wrong, not the fact that a word exists to describe some facet of how your brain works. Having community is pretty much the best thing. They will figure it out anyway. I want to help Jake develop confidence, courage, and self-esteem. I believe that these traits, along with faith and a lot of work ethic, will be his most important life tools. I truly don’t know when. Or how. I’d like to ease into it, just little bits at a time, and without a big fuss about it. I want to talk about how Jake is autistic without lowering my voice, without glancing at him for his reaction. I want it to become a part of the natural vocabulary in our home, and have it be wonderful. I want to be able to support and connect Jake, to build up his self-identity and value. Jess can’t stop herself from asking a final question, and I feel it bears repeating. I am quite certain that sooner is better than later. I guess it is the how that I’m really stuck on. Today we had our second IEP meeting with Jake’s school. I have read such heartbreaking stories of others’ anxiety about these meetings. How things can go so poorly, misunderstandings can happen, people don’t see eye to eye, and stress rules. It just is so different at our school and I am so thankful. I’ve also read some other stories like ours. We are those people with the amazing team who love our son, who get him, support him, love him, and listen to us. I cannot believe what a gift this autism diagnosis has been to me. One year ago, I was so worried about Jake. I was so scared of kindergarten, but I was even more scared of more days of him being home. I didn’t know if I should hold him back a year, or put him in school. I felt selfish because I didn’t know how to handle him and I needed help. I felt hopeless because it was as though my relationship with Jake was based on rules, punishments, and not getting anywhere. Meltdowns were violent, heartbreaking, long-lasting, and often. I didn’t know if he was autistic or not, I didn’t know what that meant, I didn’t know what I was doing. I did know I needed help. Now he is so successful. He is so happy. He rarely has a big meltdown. He knows how to calm himself down when he is upset, and I know how to help him. Jake can articulate what he needs and how he is feeling, and I know enough to listen. He is doing so well. I am doing so much better. I am able to stay calm when I talk to him. I am able to separate discipline and support, punishments that are important and effective and when all he really needs is time and help cooling off. Being officially autistic has given Jake such opportunities. He is pulled out of the kindergarten class with a small group for learning assistance twice a week. He is pulled out with another group for speech and language in social situations support once a week. He gets one on one time with his behavior consultant twice a week at school and twice a week at home. There are two educational assistants in his class who listen to him, support him, prep him for transitions, and make his day run smoothly. And of course, his teacher is incredible. She has encouraged him and listened to him. She has directed all of this. She is amazing. We are so, so blessed. I know that there are other kids who have similar needs and need support in similar areas. But our diagnosis has given us access to so much extra support. There are times I wish they had a similar diagnosis so they could have all the good that we have too. There are days I don’t know why Jake has to deal with this. I don’t know why this happened to my baby, to our family. Days like today, I don’t know why it happened but I am thankful. How complicated. I want to share this blessing. I want to share. I am prayerful. I believe that God gives to us with responsibility. We are stewards of His blessings. Today I am resting in relief, soaking in the joy that came from this meeting with the people who make up our team. I am praying for direction, for keys to what to do in the future. I do know that my desire to focus on the positive, my attitude about Jake being autistic, has been strengthened. There is nothing in the DSM-III, DSM-IV, or DSM-V that says autistic kids are anything less than incredible. Like Temple Grandin said, “Just different.” And he’s such a cute little kid. We went to a birthday party this weekend. It was so fun. Seriously fun. Not because it was at the gymnastics club where kids had too many choices and ran until they were spent. It wasn’t. Not because every kid from the kindergarten class was there competing for the birthday girls’ attention and fighting over the toys. They weren’t there. Not because there were tons of sweets and treats. There weren’t. It was seriously fun because it was simple. And relaxed. There was a grand total of eight kids there, including Penny who is now 7 months old and all of the siblings. All of the parents stayed and visited and had nowhere else to go. There were no noisy games and all of the kids were happy. They knew each other. They knew where the bathroom was. How amazing. This is what makes my heart full. Such normal, casual, comfortable friendship and acceptance. As April and Autism Awareness month roll on, I have really noticed that it is amazing how people can help each other. I have been spending every minute that I have to myself online reading the thoughts, wisdom, and challenges of others around the world. Autistics, parents, researchers, you name it. It is truly incredible, inspiring, and thought-provoking. I am growing, seriously growing, and my goal of becoming an amazing, educated, know-what-I’m-talking-about, autism mama is morphing into a passion. It turns out there is a lot to learn! Ha! I know! Those of you out there who have gone before me are laughing. I knew I didn’t know things. I had no idea how much there is to learn. I am incredibly thankful to these people, real people, out there, in the real world, sharing their revelations, thoughts, experiences, and ideas with me. I don’t know them. They are just giving, opening their lives and minds to the world, and oh! It’s a community! It’s people like me! Like Jake! Like our family! I have found great inspiration in blogs from other moms. I have read hours of stories of their struggles and victories, their hopes and their experiences. Equally inspiring are the words of adults on the spectrum, who have shared their stories. I have devoured books and combed blogs. The words of the people who live with autism are awe inspiring. What’s more, they are friendly. There is a real, authentic community of people growing that is welcoming and kind. It is hopeful and encouraging. It uses words I need to wrap my head around and get used to, but I know now will become an easy part of my vocabulary in time. Things like neurodivergency and stimming, autistic and proud. The following was written by one such autistic, and it is resonating deeply with me. “I’m not alone” doesn’t have to be an adulthood revelation; it can be a given. Your child deserves to grow up knowing that he isn’t alone, that there’s a whole community that will embrace him because he’s one of ours. I am going to be a part of this community. Jake is going to be a part of it. He will not be alone, he will not be a minority, and he will have a voice, and a place where he is among others like him. Where he is not different. Not special. That is funny to me. And wonderful. There are many places where he will be special. Where he cannot help but be noticed. Where he is a minority. But out there, in the internet, there are more of our people. Our authentic community surrounds us. I am adding our stories to the rest, sharing education with those I know personally and those who now read this out there online. What an incredible thing. The pastor at our church has been working hard with all of us faithful churchgoers, trying to coach us into an authentic intergenerational community. He has spoken about how we need to share our stories with each other in order to develop this authenticity and community. Time and time again I have seen the power in this simple process. When we share our stories, we share what God has done in our lives. We share our hopes, our fears, our sins, our redemption. We begin to appreciate other people for who they are, and how they inspire us. We end up joining our journeys together, becoming stronger, more resilient, and more alive in the process. God did not create us to live alone. We are designed for community. April is Autism Awareness Month. Our first Autism Awareness Month as an official autism family. As such, I have struggled with what to do. I am interested and excited to view Autism Awareness Month from an “inside” position, from a place of more knowledge and more curiosity. I also feel called to share something of our story. This isn’t so easy. We are connected to real people here in our real lives, friends and family who know us and our story, who have been supporting us all along. And we have other people in our real lives, those acquaintances and facebook friends that don’t know all the gritty details. Finally, we have the extended family and distant friends, separated by distance and busy lives and yet connected through history and love. Who do I share our story with? How? What do I say? This year I have decided to start small. I don’t feel comfortable explaining Jake’s diagnosis on facebook, and I don’t feel like all the people I am loosely connected to online need to know all about it yet. I am not ashamed of him or the diagnosis, rather I want to protect him, allow him to form his identity before I go about creating one for him online. Also, the way information travels through facebook troubles me. People he hasn’t yet met could hear about him and form opinions about him without meeting him in person. However, our there are some people who are different in a few interesting ways. One, they will probably never spend much time with my kids. Life is just too busy, we are separated by so many miles. People who I spent so much of my childhood with are creating childhoods for their children and the only way we are currently related is online. And yet, this is a good way to connect and form an authentic community. I can share our journey so far, be open about what we are going through, and create a deeper connection between us. I know when I get an email, a phone call, or even a Christmas card, it thrills me. I feel like we are still related, connected, on different paths but still journeying together. The reason we don’t have authentic community is often fear. Fear of being misunderstood, of being judged, or of bringing up something that will offend. There is a huge desire in my generation to be heard, to tell our story, to share what is going on with my life. This partially comes out of living a life saturated with social media. I don’t think that all we crave is our fifteen minutes of fame, however. I think we are craving a community, a support, a sense that we are not alone in our journey. I know how much I’ve changed in the last six years. I feel like I am a completely different person. One with more sympathy, more empathy, more real friends, and much less judgment and fear in my life. This is because I have been on a journey, and I have had people to share it with me. People to cry with me, encourage me, pray for me, and inspire me. Some of these people are very close to me and others have never heard of me. It comes from sharing our stories. Being authentic with people. I don’t invite shame. I don’t invite judgment. Not happening here. This prompted me to send an email explaining Jake’s diagnosis, autism, and the blog a little to some treasured, more distant, people. I am so happy about it. I know they can relate to some of the parenting stuff that we are all going through. I know they can relate to caring so much about our kids that we are diving in without a thought. I know that they don’t know what to say, don’t know how to respond. It’s all good. I feel like I am spreading awareness, I am hoping I am spreading hope. Thank you for being a part of my community.